Also Called: Blue false indigo. Stems: Erect, stout, glabrous, waxy, widely spreading branches. Leaves: Alternate, on stalks 1/4 to 3/4 inch long, 3-foliolate; stipules lanceolate, 1/4 to 3/4 inch long, tips pointed; leaflets oblanceolate to oval, 1 to 2 inches long, 1/4 to 1 inch wide; bases narrowed; tips blunt. Inflorescences: Racemes, erect, 4 to 20 inches long, loosely flowered, terminal. Flowers: On very short stalks; bracts lanceolate, often absent by flowering; calyces 2-lipped, glabrous; corollas papilionaceous, indigo-blue to purple, about 1 inch long; banner prominent, tip notched; stamens 10, separate. Fruits: Pods, oblong, 1 to 2.5 inch long, inflated, dark brown to blackish, beaked; seeds small, black. Habitat: Rocky prairies, hillsides, open woods, and roadsides, most abundant in limestone or clay soils. Comments: When mature, loose seeds in the pods will rattle in the wind. 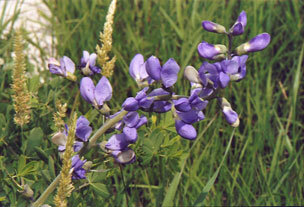 The sap of blue wild indigo turns purple or slate color when exposed to air.